• 2nd level deck and ground level patio with outdoor furniture. • Super Fast Internet -14Mbps download and 10Mbps Upload. • Beautiful View's of the Murchison Mountains - From the living area and deck! → Entire space is included in this rental. Please relax & make yourself at home. I am here for you during your stay, but our level of interaction is up to you. I'm only a phone call/message away. You will self-check-in upon arrival. 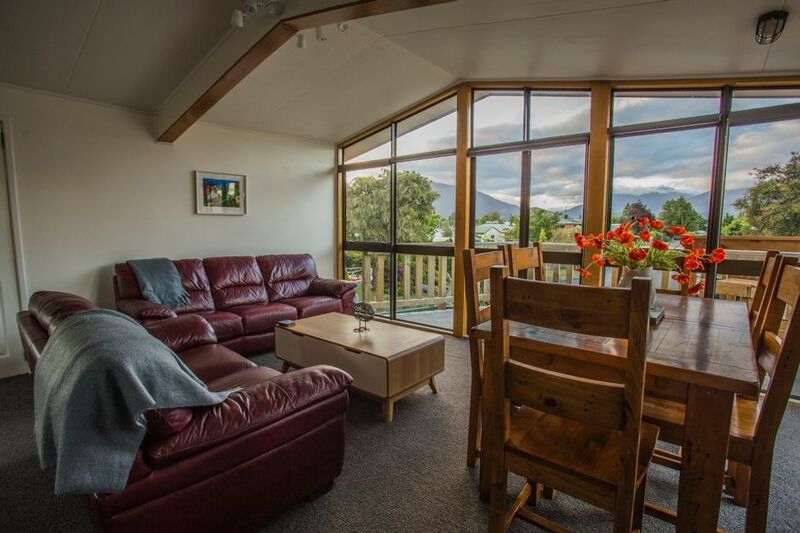 Check out the website Destination Fiordland for more information or contact us via Airbnb. The house is located 2 minutes to the centre of town by foot and 5 minutes to the lake. Otherwise, a car is needed to get around.If you are traveling to Milford Sound the drive is approximately 2 hours. There are bussing services from Te Anau available. Great place to stay with good views. Neighborhood was quiet. Easy access to town, nice accommodations. We had a quick stay over on our way to Milford Sound and it had everything that we needed. Easy to walk to town for dinner. We stayed in Te Anau for two nights so we could get to Millford Sound and back without it being too tiring. The town is much more lively than we'd expected and we had two nice dinner meals out there. (Recommend making a reservation at Kepler's) We had a very comfortable stay at Margie's house. With all the bedrooms on the first floor we could easily unload our luggage and get settled. It has more 'extras' than many places. Very nice hot water (which were missing in a much more expensive home we rented in Queenstown). Good air conditioning. Looked like it had been freshly painted. Well stocked kitchen. I think the only thing we missed was a cutting board and teapot (maybe they were there but we didn't bother Margie to ask). It is within walking distance of the main restaurant/store area. Everyone enjoyed it greatly and we could wash our clothes, have some lovely breakfasts as a family and game nights on her large dining table. Very comfortable den and TV viewing areas too. Many thanks! Extremely close to town, had a lovely weekend in a very clean and tidy house. Extremely close to town, had a lovely weekend in a very clean and tidy house. VERY cold weekend in Te Anau but kept warm with an awesome heat pump and panel heaters. Sceneric location. Everything was fine. Great house in a quite street. Great house in a quite street. We had a nice few days there.